TOP SPEED. At the beginning of 1936 the world’s fastest single-engined boat was Miss Britain III, driven, built and owned by Mr. Hubert Scott-Paine. Her hull was of aluminium alloy, her length 20 ft 6-in, and her beam 8 feet. The single Napier engine developed 1,375 brake-horse-power at 3,600 r.p.m. In 1934 Miss Britain III set up the remarkable record of 110·11 miles an hour at Genoa. THE racing motor boat is the fastest of all craft. In fewer than fifty years the motor boat has developed from a slow launch into a craft capable of more than two statute miles a minute. It has cost millions of pounds and years of experiment to achieve this result. Only one boat, Miss America X, driven by Commodore Gar Wood, has been driven at this speed. Miss England III has, however, also reached a speed only a fraction below that of Miss America X. The cleverest engineers and the finest craftsmen among boat builders have co-operated with men who have trained themselves to manoeuvre boats at more than express-train speed. Although the world’s speed record was set up on fresh water, the first man to achieve 100 miles an hour on salt water was Mr. Hubert Scott-Paine, the famous British sportsman. Driving Miss Britain III, he achieved this speed on Southampton Water in November, 1933. In the following year, driving the same boat in Italy, he set up a record of 110·11 miles an hour. The first motor boat on record was put into the water of a lake in Germany in 1886 by Gottlieb Daimler, the motorcar pioneer. She was a small launch little different in shape from the launches of to-day. A single-cylinder 1½ horsepower benzine motor propelled her. There is a fundamental difference between the modern hydroplanes and the original motor boat. These craft to-day skim the water at high speeds and are a link between the water and the air, as the engines which propel them are generally supercharged aeroplane engines. Some of the problems of operating and designing the engines have been solved with the help of the experience obtained from aeroplanes. At high speeds the boats sit on their tails, and the rudders and propellers operate in only a few inches of water. So uncertain were the performances of the early motors that the drivers had necessarily to be skilled mechanics able to diagnose and cope with any engine trouble. Many of the drivers were setting up in business as makers of internal combustion engines and had gained great experience from racing motor cars. Sometimes wealthy men bought motor boats, which were tuned up and raced by mechanics. Although many pioneers were motorists they depended upon boat-builders for the hulls; but certain naval architects and boat-builders became interested and designed hulls to suit the new method of propulsion. Other people looked upon the motor boat as a pleasure craft and placed reliability before speed; but the racing motorists who had gone afloat obtained speeds equal to those of ocean-going steamships. There was no central organization of racing, although there was international rivalry. Then, in 1903, Sir Alfred Harmsworth, afterwards Lord Northcliffe, offered a cup for international competition, to be open to boats of less than 40 feet in length, the boat and engine to have been built entirely in the country represented, and her driver to be of that nationality. The Harmsworth Trophy, the name of which was afterwards altered to the British International Trophy, although it is often referred to under the old title, is the blue riband of motor-boat racing. From time to time the rules have been amended, but the trophy is still the supreme prize of the motorboat racing world, just as the America’s Cup is for yachting. The award to the winner of two out of three heats is, at the time of writing, held by Commodore Gar Wood, who holds also the world record for speed on water. The first contest for the trophy was not international, because the interval between the announcement and the race was too short to allow foreign competitors to build special boats and engines. The race was held in the harbour of Queenstown (Cobh) and was won by Mr. S. F. Edge’s Napier I, which was driven by Mr. Campbell Muir. The boat at times attained a speed of nearly twenty knots. This race introduced the second phase in the history of the motor boat, which was fast emerging from obscurity and experiment. The following summer of 1904 was marked by three big events - a cross-Channel race, a reliability trial and a race for the Harmsworth Trophy that was truly international, as three nations competed. In that year the motor boat proved its speed, seaworthiness and reliability. Mr. S. F. Edge’s Napier Minor was prominent in all three events. Mr. Edge was an outstanding personality among the men who applied their land motoring experience and engineering skill to obtaining speed afloat. He began with cycling, became one of the best-known racing cyclists of his day, and then one of the pioneers of the motor-car industry in Great Britain. He then turned his attention to the racing motor boat. The Napier Minor, with which he did so well, was 35 feet long and had a 55 horse-power Napier engine. So many of the owners and drivers of motor boats were motorists that they looked upon the club now known as the Royal Automobile Club as their authority. The marine section of the club arranged the reliability trials on Southampton Water. Nine boats competed for the Harmsworth Trophy off Ryde in the Isle of Wight, five being British, three French and one American. Mr. Edge drove the Napier Minor to victory at a speed of 23½ miles an hour, defeating one of the French boats, Trefle-a-Quatre. In the cross-Channel race from Calais to Dover, the Napier Minor came in second to the winner, Mercedes IV, with a 60 horse-power motor, which covered the course in seven seconds over the hour. This race aroused enthusiasm on either side of the Channel, and the French Navy sent a destroyer to lead the motor boats across. The destroyer had to steam “all out” to prevent herself being overtaken by the swift Mercedes IV; the reliability of the fast motor boat was shown by the fact that all except one of the twenty-one starters completed the distance. Later in the year Mr. Edge, with other racing motor-boat owners and owners of motor launches, attended a meeting in London presided over by Mr. Noel Kenealy, and the British Motor Boat Club was formed. THE RACE BEGINS. This photograph was taken a few seconds after the starting gun had sounded for the Harmsworth Trophy race in September 1931. Mr. Kaye Don can be seen leading in Miss England II. The first race for the Harmsworth Trophy was in 1904. The length of each of the three heats must be between thirty and forty miles. With the development of the internal combustion engine the speeds of fast boats increased. The ratio of the power to the weight of the engine became sufficiently favourable to cause boat designers to turn their attention to the hydroplane - an idea that had not proved practicable in the days of steam, because of the weight of the steam engine. The idea had been submitted to the British Admiralty in 1872 by a clergyman, the Rev. C. M. Ramus, of Playden Rectory, Rye, Sussex. It consisted of building a vessel of two wedge-shaped bodies, one abaft the other, so that the resistance of the water at high speeds would cause the boat to be lifted out of the water. In 1877 Sir John Thornycroft took out patents for craft intended to skim the water, but again the lack of a light high-power engine stopped developments for nearly thirty years. Then Thornycroft’s and other firms wedded the motor to the skimming boat and the hydroplane became a reality. The American boat Dixie took the Harmsworth Trophy across the Atlantic in 1907, and it was not regained by Britain until the Maple Leaf IV was victorious in 1912. 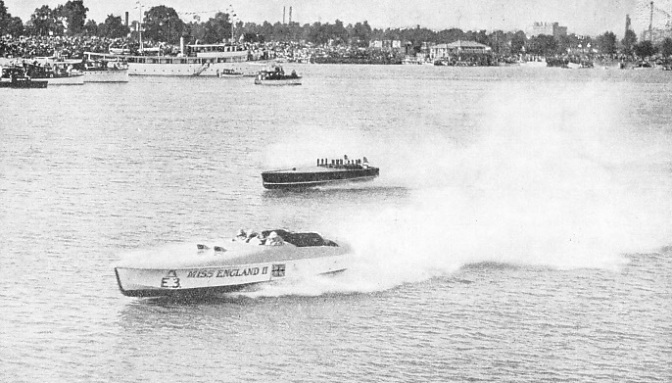 The Maple Leaf IV, a 40-ft hydroplane, had a 760 horse-power New Orleans engine, rebuilt by Austin. She won at more than forty knots, and retained the trophy in 1913 by exceeding fifty knots. There was no race during the war of 1914-18, or in 1919, but in 1920 Commodore Gar Wood won the trophy with the first of his series of Miss America boats. She was 26 feet long, of over 800 horse-power, and had a speed of 56 knots. The difference in speed between the races of 1913 and 1920 was not great. But after 1920 the power and speed increased remarkably, making the cost of the craft so great that only the wealthiest could afford to consider an attempt to win. Indeed, Miss M. B. Carstairs, who entered several boats named Estelle, is stated to have spent about £100,000 on them in spirited but vain efforts to win back the trophy for Great Britain. The cost of financing one of the Miss England boats owned by Lord Wakefield has been put at £25,000. Another is said to have cost about £40,000. The main problem is the ratio between power and weight. Commodore Gar Wood has preferred to pack as much power as possible into a boat that remains within the 40 feet limit of the Harmsworth Trophy rules. The British racing men have preferred to cut down weight by limiting the size of the engine and therefore that of the boat. Some splendid craft have been produced by British engineers on the lines of this policy, notably by Mr. Hubert Scott-Paine, of the British Power Boat Company, who is one of the finest drivers of racing boats in the world, and one of the pioneers of modern high-speed craft. His firm constructed Miss England, which Major (afterwards Sir Henry) Segrave took to the United States, where he defeated Commodore Gar Wood in a race against Miss America VII. The American boat had more than double the power of the British boat, having been equipped with engines developing 2,300 horsepower against the 930 horse-power of the single Napier Lion engine. Although the British boat achieved about 90 miles an hour this was below the speed on the straight of the American; but Segrave was much quicker at turning, and in his efforts to avoid losing distance at the turns Commodore Gar Wood put such strain on the steering gear that it could not stand the pressure and failed. The next British boat, Miss England II, was fitted with two Rolls-Royce engines, each developing 1,900 horsepower, and was built by Saunders-Roe, Ltd., of East Cowes. Sir Henry Segrave, accompanied by two engineers, made two runs over the measured mile on Lake Windermere, Westmorland, in June, 1930, one at 96·41, and the other at 101·11 miles an hour, giving a mean speed of 98·76 miles an hour. Having thus broken the world’s speed record, he began a third run. The boat struck some submerged object and sank, Sir Henry and Mr. Halliwell, one of the engineers, losing their lives. In less than a year the record was beaten, for in March, 1931, Commodore Gar Wood, set up a new record of 102·256 miles an hour, which lasted for less time than the previous one. ON THE DETROIT RIVER. 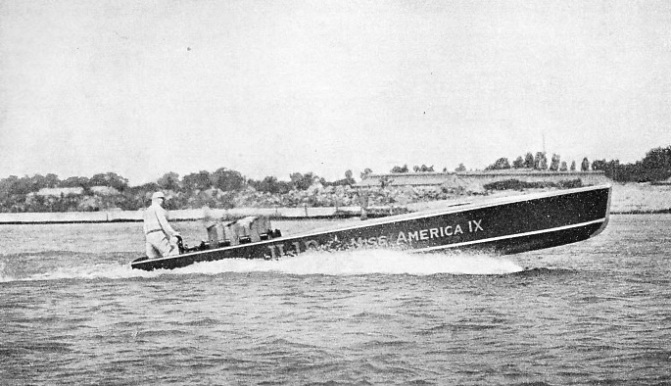 Miss America IX being given her first test run in August, 1930, when the boat, driven by Commodore Gar Wood, reached approximately ninety miles an hour. Gar Wood drove Miss America IX in the race for the Harmsworth Trophy in September, 1931, which was declared void. Later, in February, 1932, Gar Wood attained 111·71 m.p.h. in Miss America IX at Miami, Florida. Mr. Kaye Don took the reconditioned Miss England II to Buenos Aires, and in April, 1931, set up a new record of 103·49 m.p.h. Later he went to Lake Garda, Italy. There he brought the speed up to 110·28 m.p.h. Meanwhile, Commodore Gar Wood had been trying to regain the record, but did not succeed. The rivals met in the race for the Harmsworth Trophy in September, 1931, there being a third contestant in Commodore Gar Wood’s brother, Mr. George Wood. The Commodore was in Miss America IX and Mr. George Wood in Miss America VIII. Mr. Kaye Don won the first race at a speed of 89·13 m.p.h., and was favourite for the second race. This second heat was a fiasco which caused considerable comment at the time. Commodore Gar Wood was off before the starting gun, and Mr. Kaye Don followed; thus both were over the line some seconds too soon. The British boat capsized, and Mr. Don and his two mechanics were rescued. Mr. George Wood started at the right time, and claimed the race, but in the end it was declared void. Miss England II was a wonderful craft, and Mr. Don handled her with great skill. She had only one propeller, which turned at 12,000 r.p.m., and weighed 15 lb. Commodore Gar Wood persevered with his attempts on the record and reached 111·71 m.p.h. at Miami, Florida, in February, 1932, with Miss America IX. Meanwhile, Miss England III was built by Thornycroft’s and equipped with two Rolls-Royce engines, each developing 1,975 horse-power, and with two propellers. The overall length was 35 feet, and the outside beam 9 ft 6-in. She is said to have cost some £40,000. In July, 1932, Mr. Don regained the record with this five-tons hydroplane by achieving 119·75 m.p.h. on Loch Lomond. In September, Mr. Don took her to Detroit to match her against his rival, Commodore Gar Wood, for the 35-miles race for the Harmsworth Trophy, the Commodore’s boat being Miss America X. The American boat was larger and far more powerful. She was 38 feet long, and 10 ft 6-in beam; her four 12-cylinder Packard engines each developed 1,600 horsepower at 2,600 r.p.m., a total of 6,400 against the 3,950 horse-power of the British challenger. About 100,000 spectators gathered to watch the duel between the two rivals on Lake St. Clair, near Detroit, Michigan. In the first race Miss England III was unfortunate. The throttle control and a pipe of the cooling system broke, so that one of her engines went out of action in the last lap, and the speed of the boat fell to little more than half. The boats began neck and neck in the second race, but a burst of flame came from the British boat, and the starboard engine gave out. Badly burned and bruised as he was, Mr. Don continued while his mechanic tried to rectify the trouble; but the great strain on the port engine was too much and it stopped. Thus Commodore Gar Wood retained the trophy. After this race Lord Wakefield decided to withdraw from sponsoring racing craft and record attempts. Commodore Gar Wood regained the speed record in September, 1932, at 124·86 miles an hour. He was the first man to achieve two miles a minute on the water. Miss America X is - at the time of writing - the fastest boat in the world, and in the view of experts it is doubtful if her supremacy will be challenged for some time. 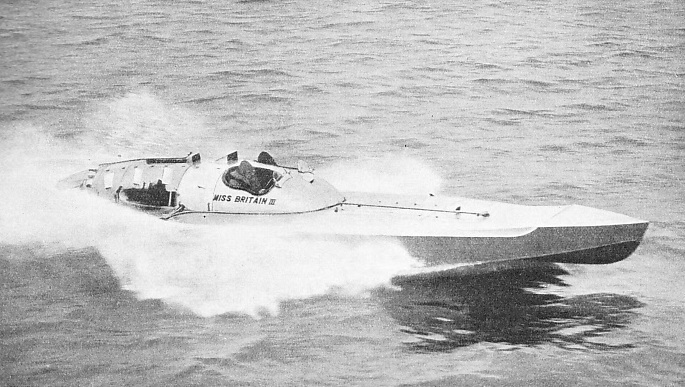 A British boat, however, Miss Britain III, designed, built, owned and driven by Mr. Hubert Scott-Paine, is the fastest single-engined boat in the world. She is a remarkable craft. Her hull is built of aluminium alloy, and she is the best example of the principle of obtaining strength, speed and stability with a comparatively small engine. Her length is 24 ft 6-in, and her beam 8 feet. Her one Napier engine develops 1,375 brake horse-power at 3,600 r.p.m. In 1933 Miss Britain III was matched against Miss America X for the Harmsworth Trophy at Detroit, and put up a speed only slightly below that of Commodore Gar Wood’s boat, the horsepower of which had been increased to 7,800. This was a marvellous performance, considering the differences in size and power. SPEEDING TO VICTORY. A remarkable photograph of two super-speed boats during the Gold Cup Regatta of 1935, on Lake George, New York. 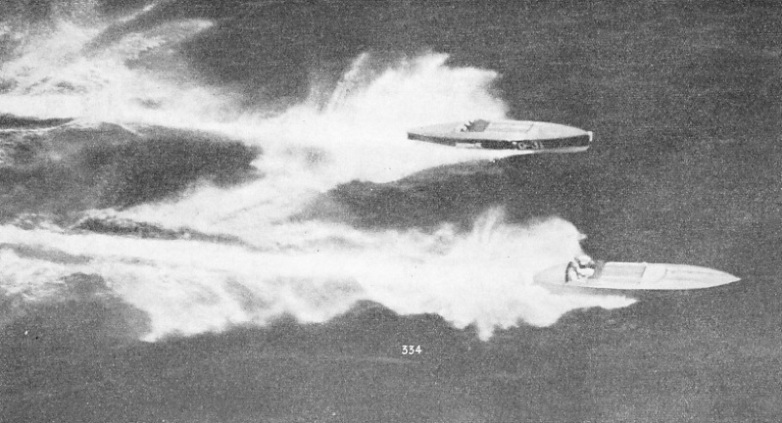 Modern racing motor-boats are propelled by supercharged aeroplane engines. At high speeds the bows of the vessels tilt upwards and the rudder and propellers operate in only a few inches of water. You can read more on “Coastal Motor-Boats” and “Romance of the Racing Clippers” on this website.